eLiberatica 2009 at University Politehnica of Bucharest. Foreign currency, credit cards: The most widely used foreign currencies are the Euro and the US dollar. There are countless exchange houses in Bucharest, as well as ATM machines which can be used without problems in case you have a credit/debit card with you. The most commonly used are Visa, MasterCard and American Express, which are accepted in most hotels, rent-a-car companies and restaurants. We advise you, though, to check in advance. 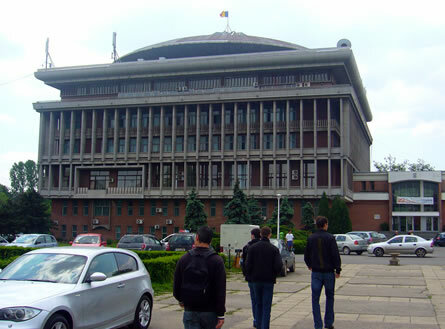 University POLITEHNICA of Bucharest (UPB) is the most important technical university in Romania. Its traditions are connected to the founding of the first higher technical school in 1818 by Gheorghe Lazar. With more than 180 years of existence, UPB represents one of the fundamental and prestigious institutions of Romanian higher education, being the main source for the technical specialists of Romania. Illustrious personalities such as Gogu Constantinescu, Elie Carafoli, Costin D. Nenitescu, known world-wide by the scientific community, were professors at the "POLITEHNICA". The organizers have no special requirements as far as dressing is concerned, but they suggest a decent outfit. For special events like "Networking and Freedom Party", we also expect the participants to dress accordingly. Bucharest Transportation: during last years, significant improvements and developments in the city's transportation and road infrastructure have been made. Bucharest has an well developed underground transportation system which meets the modern standards. Yet, surface transportation still tends to be overcrowded, therefore we advise our guests willing to travel inside the city to use either the subway or a taxi service.